I came across Irony (http://irony.codeplex.com/) today while contemplating whether to use antlr or not for a project I’m working on where the requirements call for allowing users to write small conditional instructions. Irony is a development kit for implementing languages on .NET platform. It uses the flexibility and power of c# language and .NET Framework 3.5 to implement a completely new and streamlined technology of compiler construction. Unlike most existing yacc/lex-style solutions Irony does not employ any scanner or parser code generation from grammar specifications written in a specialized meta-language. In Irony the target language grammar is coded directly in c# using operator overloading to express grammar constructs. Irony’s scanner and parser modules use the grammar encoded as c# class to control the parsing process. 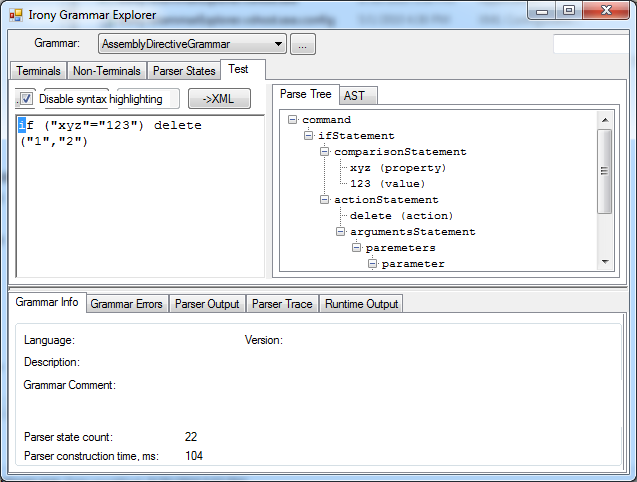 See the expression grammar sample for an example of grammar definition in c# class, and using it in a working parser. Compared to antlr, it seemed much simpler from the samples. In the past, I’ve usually used Spring.NET‘s expression evaluation functionality (built on antlr); however, the entirety of the Sprint.NET library seemed too heavy for the simple scenario I had to implement and I’d still have to do some string parsing anyways if I used it. So I set out to try out Irony for myself instead. Once the grammar is complete, the next step is to make use of it. // Mock up the input. // Mock up the instructions. The idea is to simulate a scenario where the metadata on a document stored in SharePoint is mapped to a dictionary which is then passed to a processor. The processor will iterate through the instructions embedded in the document and perform actions. You can see that in this case, the evaluation is very simple; it’s a basic string equality comparison. The action execution is basic as well. It simply executes a method of the same name on the current object instance. Try running the code and changing the “ready” value in the dictionary and see what happens. This sample is fairly basic, but it was pretty easy to get up and running (far easier than antlr) and there’s lots of potential for other use cases. One thing I’ve found lacking so far is documentation. It’s fairly sparse so there’s going to be a lot of trial and error, but the good news is that the source code includes a lot of examples (some of them fairly complex including C#, SQL, and Scheme grammars).